With no Big Klub to fawn over, Sky only allowed 15 minutes of punditry before kick off. At least we were treated to the comely Kelly Cates in her little black dress ably assisted by former Scummers, Jamie Redknapp and Matt Le Tiss. Jamie, of course, was part of our 2005 "relegation squad" and said having his dad as manager didn't help; quite! Le Tiss was, of course, Le Tiss. On the gantry were Bill Leslie and Andy Hinchcliffe so not a Swansea connection in sight. 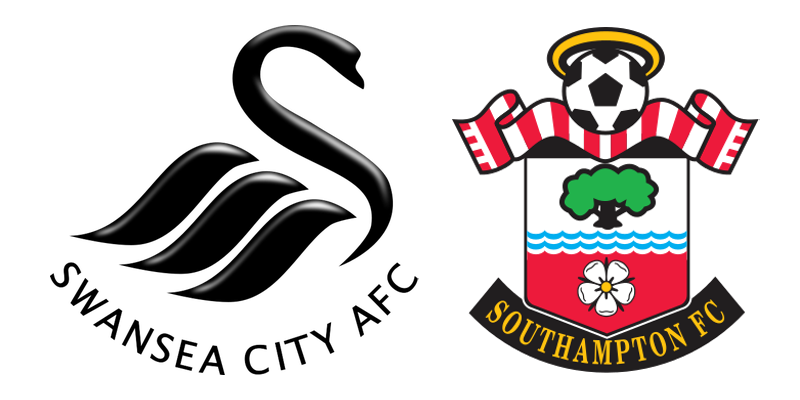 The Swans brought back Naughton, Clucas and King and Saints had two enforced changes – Stephens for Maya and Redmond for Lemina. It was, apparently, Romeu's 100th PL start. I liked the attitude of Michael Oliver in the tunnel; eyes straight ahead, no joshing with the captains and determined, it seemed, to referee this important fixture well. As Saints kicked off, Sky showed close ups of both managers – Carvahal looked nervous but Hughes sat with just a hint of a smile. His charges dominated the early exchanges but the first chance fell to Swansea when Romeu tripped Ayew on 3m. He, or his brother, drove the free-kick straight into Saints wall. Saints continued to press and Romeu's cross was headed away. Then, on 7m, Redmond helped set up Bertie but his tame shot was comfortably collected by Fabianski. Swansea responded and Andy King hit a low shot which McCarthy held onto. After 10m no clear pattern had developed but most of the game was being played in Swansea's half. That soon changed as Swansea began to retain the ball better. Ayew burst into the box but Saints nicked the ball away. Then Hoedt was obliged to head Olsson's cross away. On 17m Charlie was clattered from behind but we wasted the free-kick. Moments later Redmond had a glorious opportunity to play Charlie in but his horribly overhit pass rolled safely to the keeper. On 20m Oliver dished out the first yellow for Ki's trip on Højbjerg. On 23m McCarthy punched away a Jordan Ayew cross and for a good couple of minutes the ball just went up and down our left touchline. When Swansea eventually launched a cross we allowed it to bounce in our box obliging Cédric to put it out for a corner. Ki's cross was headed out but we struggled to clear. Eventually Jordan leapt to reach a cross but sent his header high over the bar. As the half hour approached the play became very scrappy. Eventually Swansea launched another cross into our box, but McCarthy came out to claim it. Then on 30m Redmond nicked the ball and laid it back to Charlie, but his shot was awful and rolled wide. A minute later Højbjerg split Swansea wide open with a great through ball but, although Charlie caught this one good and proper, he was unable to beat Fabianski. A minute later King's cross was met at the near post by Clucas but his glanced header went wide. I was thinking that the Swans were seeing too much of the ball when Charlie tackled back and presented the ball to Redmond. He promptly gave it back to them. On 38m Romeu was booked for a late tackle. We seemed unable to get Ki's free kick away cleanly and once again Cédric was required to head behind for a corner. We finally got Ki's corner away but we were looking poor now. Just at that moment the 2,000 Saints fans began to sing and if it lifted spirits, it did nothing to improve Redmond's ball retention. Fortunately Swansea looked incapable of profiting from their dominance. Another laboured build-up ended with Ayew's cross clearing our bar. Then, suddenly we were raiding down the right and Tadić found Cédric. His lovely cross was met on the volley by Charlie but the ball flew straight into the keeper's gloves – and stuck. On 44m Redmond cut in forcing Ayew to conceded a corner. Hoedt flicked on Tadić's cross but Swansea got it away. As we moved into 1 added minute it was all Saints. Indeed, it was Swansea looking most relieved when the half time whistle blew. 0-0 and still everything to play for. I'm not a Redmond knocker but when he is bad, he is shocking. He was clearly not at it and I was hoping to see Long or Sims replace him at half time. There were no changes though – other than me opening a bottle of Old Rascal to ease the suffering. Swansea kicked off with half their blokes in our half. Where Jon Moss would have let them get on with it, Mr Oliver insisted on restarting. Swansea created their best chance on 47m: Jordan Ayew cut in from the left and curled a beautiful effort into the top corner. McCarthy got across well and touched it over the bar; cracking save; Saints cleared the resulting corner. Moments later McCarthy was called into action again. He tried to kick a high, bouncing back-pass and sliced it behind for another Swansea corner. Thankfully they wasted this one too. The football was getting worse. There was a brief pause while Naughton was treated for a head injury. It was not serious and when the game restarted on 52m, Tadić set up Charlie whose firm shot was caught by Fabianski at his near post. Then the Serb lost out in a challenge with Fernandez and stayed down as if he didn't fancy it anymore. To add to our plight, Romeu then started gifting the ball to the opposition. Of course, Redmond immediately did something good, winning us a corner. Tadić's cross was cleared but when the ball was played back in, Charlie was trudging back, miles offside. It looked like it wasn't going to happen for us. As ever, as soon as you doubt them, Saints rouse themselves and on 59m the industrious Cédric won another corner. Bertie's cross was put behind for another on the left. Tadić took this and Stephens laid the ball back to Cédric. His beautiful cross found Charlie right between the posts. A glance into either corner would have put us ahead: instead it hit the keeper firmly on the chest and he clasped it. Swansea made the first change, bringing on Abraham foe Olsson and dropping Clucas back to wing-back. Abraham is a big unit and posed different problems to either Ayew. Thankfully, Hoedt was doing sterling work heading crosses away from our goal. On 64m Long finally replaced Redmond but seemed unusually quiet. I eventually realised he was playing on the right and covering the space left every time Cédric bombed forward. On 65m the hand of fate struck; or rather the hand of McCarthy struck Bednarek as he came out for a cross. The young pole was, briefly, out cold. Four minutes later he was wanting to carry on, but Hughes made a season-defining call by bringing on Gabbiadini and going to a back four. On 70m Abraham drew a save from McCarthy but the next attack, up the other end, would prove conclusive. On 72m Tadić won a corner on the left which he took himself. All three Saints forwards waited for the cross. It went long, to Long at the far post. His header back was helped on by Romeu, falling to Austin. Again, Charlie's shot hit the keeper but this time the ball ran loose. With defenders all around him, Gabbi moved quickest, blasting the rebound past them and saving Saints' season: Swansea 0 SFC1. "Now just keep a clean sheet FFS!" I wrote in my notebook. The TV showed great shots of the utter pandemonium behind the goal, filled with Southampton fans. On 75m Naughton was replaced by Narsingh but Swansea were now on the back foot. Saints controlled the ball well and, on 80m, Højbjerg won a corner off Ki. Again, the ball arrived with Cédric and again he found Charlie. This was a harder header but again the keeper saved it. On 82m the final changes were made with Carroll on for King and McQueen for Tadić. On 84m Bertie fouled Narsingh allowing him to curl a free-kick across our box. Saints kept a high line and as soon as Andre Ayew moved towards the ball he was flagged offside. Hinchcliffe was impressed. Narsingh was now posing a problem down their right but Saints were able to get his crosses away. Eventually the ball came to Ki but his wild slice sailed into the crowd. With Bertie now sitting back McQueen was able to range forward, where he won a throw deep in Swansea's half. On 89m Hoedt conceded a corner, but when the second ball came in another Swansea forward was flagged offside. In the last minute, Gabbi gave Long the chance to finish it, but Shane hit the side netting, forcing us to endure 6 added minutes. Over half this time was due to the Bednarek injury and Oliver had made no howlers so far. Saints survived one more scare when Abraham pinned Hoedt, trapped the ball on his chest then tried to volley the dropping ball. His timing was good, but not good enough as he spooned it over McCarthy's bar. On 94m Long threatened to break into the empty space behind Swansea's players. Fernandes got a yellow card for his crude challenge to bring the Irishman down. Gabbi had a shot saved but Saints seemed content to soak up pressure and waste as much time as they could. The final action saw Fabianski launch the ball over all 22 outfield players into Saints' box where McCarthy gratefully fell on it. Seconds later the final whistle blew. To all intents and purposes, Saints were safe. The celebrations on the pitch and in the away end suggested everyone there believed we were. The bonus of course was relegating West Brom who colluded with the Skates to ensure we went down in 2005. Have some of that Baggies! I left Sky on after the match and caught some of Wee Gordon commenting on Saint's celebrations. Here is a guy who won plenty of trophies as a player and he reckons you never, ever see winners celebrating with that intensity. He thinks it impossible for footballers to feel better than Southampton players did after winning on Tuesday night. One of our key players in 2018 has been Alex McCarthy. As our side has struggled to gather sufficient points to evade the drop, he has regularly contributed positively. Not only will he leave his line to bail out the defence but, when called upon, he has produced top quality saves to prevent goals. Yesterday he delivered a typical performance and his save from Jordan Ayew was just as important as Gabbi's goal in last night's win. Well played Alex, my Man of the Match.